Event #3: $365 Omaha 8 or Better is down to the final 27 players, and they are now on a 15 minute break. The top 15 players will make the money, with a miscash worth $711. The final table has been reached in Event #2: $1,125. Only 9 players remain and they will resume tomorrow at 1 p.m. Chip counts and seating assignments will be posted shortly. Event #2: $1,125 NLH has played down to the final 16 players and are now hand for hand. The next player to bust will be the bubble boy, while the remaining 15 players will be guaranteed at least a $2,426 payday. Still alive in the field are Ryan Eriquezzo and Michael Nye. Play will likely stop when a final table is reached. Edwin had the best hand with a pair but James was very live with two overs and a gutshot. The [Jc] on the turn was enough to seal the deal as James had made a straight and Edwin was drawing dead. The [5d] hit the river to give Edwin a losing two pair. 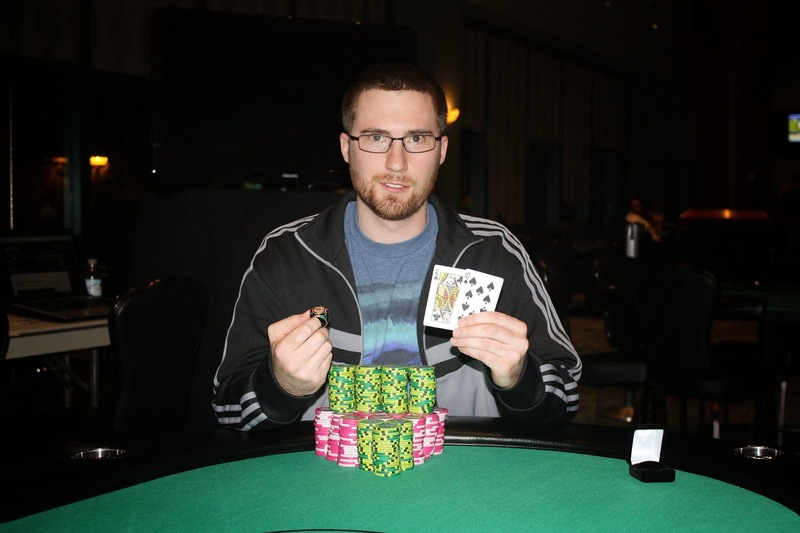 James Watt will collect $35,235 for his 1st place along with the World Series of Poker Circuit ring and the title. On a [6s][4d][3h] flop, Edwin Balcarcel was all in with [5d][3d] and was called by James Watt holding [Ah][7s]. Edwin flopped bottom pair and an open ended straight draw, and merely had to avoid James's gutshot and overcard. The [2h] turn changed nothing and the [8d] left James with just ace high. Edwin will double up to approximately 2,200,000. Play is heads up in Event #1: $365 NLH between James Watt and Edwin Balcarcel, and the two have elected to take the scheduled one hour dinner break. Play will resume at approximately 7:55pm EST, though it may restart earlier if the players return. The live stream will also resume at that point. On a [2d][6h][9d] flop, Richard Milo was all in holding [Qd][4d] against James Watt's [Ks][Kd]. Richard picked up additional outs when the [4c] hit the turn, but the [9c] fell on the river to keep the pair of kings in front. Richard stood for a minute to digest the fact that he had been eliminated, but eventually went to the payout desk to collect his $15,940 for 3rd place. Scott Leedberg was all in preflop holding [Ah][4s] against the [Ac][Tc] of Edwin Balcarcel. The board ran out [Qs][6c][5s][Ad][2h] and Scott was eliminated in 4th place, good for $11,813. 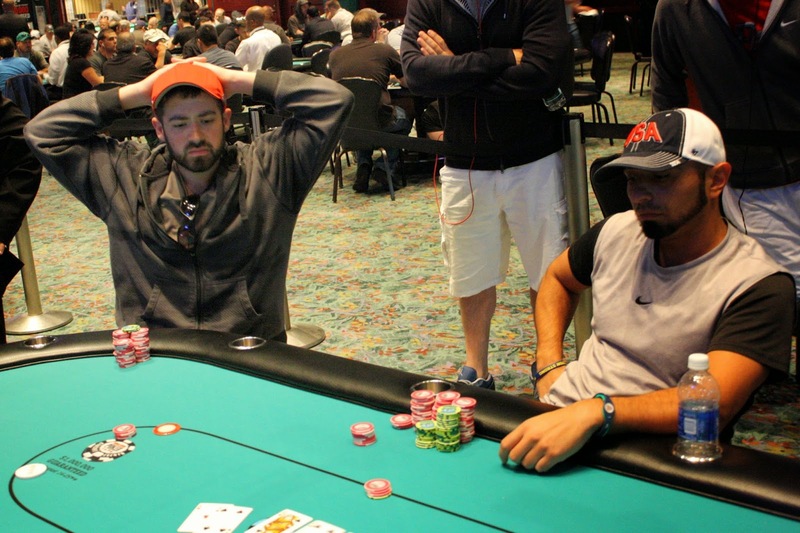 At 15,000/30,000 blinds, Richard Milo opened from the cutoff. Scott Leedberg moved all in from the small blind for a little over 400,000, and Richard eventually made the call. Richard said, "I thought you had ace king" as the flop fell [5c][Jc][4s], leaving him drawing very thin to eliminate his opponent. The [Qs] hit the turn to leave Richard drawing dead, and the meaningless [6h] fell on the river to earn Scott the double up. The four remaining players in Event #1 are now on their second break of the day. When they return, blinds will be 15,000/30,000 with a 5,000 ante. On a [4d][8s][Tc][6h] board, Alfred Renaud and Scott Leedberg got all in, not sure who had who covered. Scott had flopped a set with [Th][Td] and had Alfred drawing dead with his queen ten. The river [Qs] changed nothing, and both stacks were counted down. Scott had Alfred slightly covered, so Alfred will be our 5th place finisher. He will earn $8,893 for his efforts today. Rob Hosgood was all in preflop holding [As][9c] and was dominated by Richard Milo's [Ac][Qd]. The board ran out [8c][6s][Kh][4h][Ad] and Richard's pair of aces with a queen kicker was enough to send Rob to the rail. Rob will earn $7,494 for his 6th place finish. On a [Ac][5h][5c] flop, Kevin Tsao moved all in and Scott Leedberg called all in for less. Scott made a good call as his [As][3s] was in front of Kevin's [7s][7h]. The board ran out [Kh][Jh], and Scott doubled up, leaving Kevin crippled. On the next hand, Kevin was all in with T-3 and was unable to hit a pair against his opponent's K-J. Kevin will exit this tournament in 7th place, good for $5,202. The remaining 7 players are now on a 10 minute break. When they return, blinds will be 10,000/20,000 with a 3,000 ante. On a [Kc][7h][9d] flop, Scott Leedberg moved all in with [Kh][Jc] and Richard Milo went into the tank. After thinking about the decision, he eventually made the call with [Th][8c]. Richard had to dodge his opponent's open ended straight draw. The turn [4s] changed nothing, and the [3d] river also missed the draw, so Scott will double up. Tarun Gulati was all in preflop holding [As][6d] and was flipping against Alfred Renaud's [2s][2c]. It was a one-legged race after the [2d][Js][Jh] as Alfred flopped a full house. The [Ks] on the turn secured Tarun's elimination, and the river fell the [2h] giving Alfred quads just for good measure. Tarun will collect $4,111 for his 8th place finish. On a [8c][5c][Jh] flop, Richard Milo moved all in and Mohd Eid called all in for less. Richard had flopped two pair with his [Jd][8d], which was ahead of Mohd's [Js][Ts]. Mohd would need a ten or running cards to survive, but the turn [4s] and river [4h] left Richard's two pair in front, sending Mohd to the rail in 9th place. He will earn $3,296 for his efforts. James Watt was all in preflop holding [Ks][Kh] and was in good shape to double up against Alfred Renaud's [Qh][Qd]. The board ran out a pure [8c][Td][5d][7c][3h] board, and James doubled up to approximately 1,300,000. James Morris has been eliminated when he got all in with pocket sevens against his opponent's ace queen. The flop was a fairly safe 9-6-5, but the ace on the turn left James drawing to a six outer for a straight or a set. The river was a blank, and James headed to the payout desk to collect his $2,617 for his 10th place finish. On a [8s][5h][4h] flop, action was checked to Dena Pearlman who put out a bet. Her lone opponent check raised all in, having Dena covered. Dena eventually made the call for her tournament life and was shown the bad news, as her opponent had flopped a straight. Dena would need runner runner to improve her A-8 to a full house or quads. The [6s] fell on the turn, giving Dena chop outs, but the [Jd] landed on the river to send Dena to the rail in 11th place, good for $2,617. Our 11th place finisher was knocked out when his opponent rivered a straight. After some confusion on whether it was a chop or not, the final 10 players were reached. 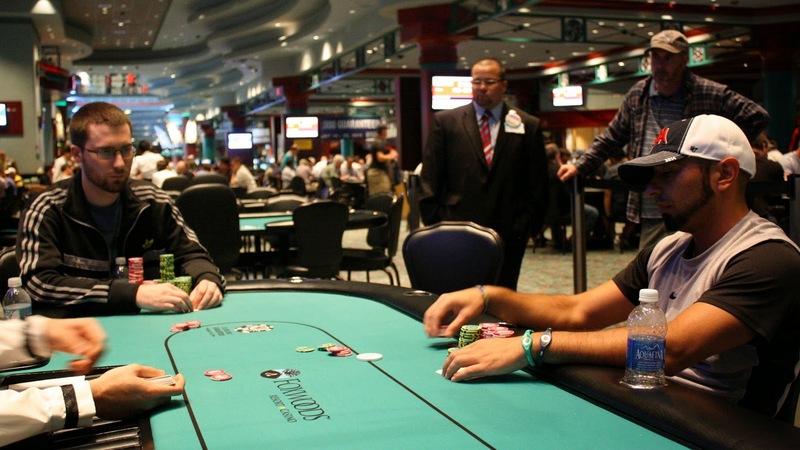 Players are redrawing for their seats at the final table and will continue play shortly. You can watch the live stream at www.FoxwoodsLive.com. Cards are back in the air for Day 2 of Event #1: $365 NLH. 13 players remain, and you can watch the featured table live at www.FoxwoodsLive.com. Meanwhile, Event #2: $1,125 NLH is on their first break of the day. Registration is open for one more hour. Event #3: $365 Omaha 8 or Better has also begun their tournament, and registration will be open until the end of the 6th level. Cards are in the air in Event #2: $1,125 NLH. This event features 15,000 in starting chips and has $100,000 Guaranteed. Blind levels start at 30 minutes and increase as the tournament progresses. Registration is open until the end of level 6, which is approximately 2:10pm. Click here to view the structure sheet for this event. At 1pm, the remaining 13 players from Event #1: $365 NLH will resume to play down to a winner. 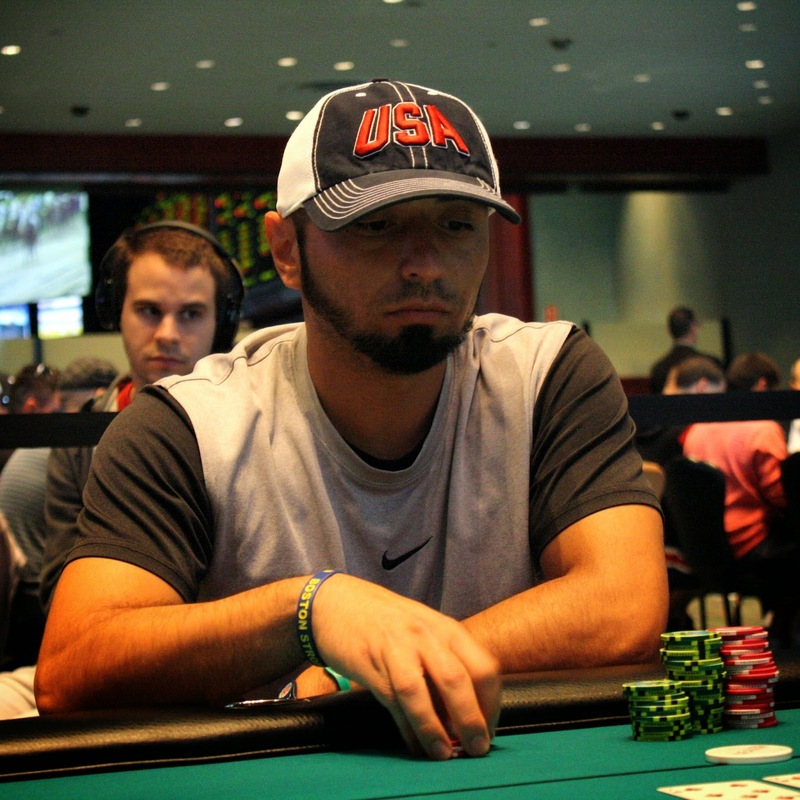 Rich Milo is the chip leader with 1,251,000. Full chip counts and seating assignments are available here. The clock has been paused with 10 minutes left in the level and the 13 remaining players will play 5 more hands before bagging up their chips for the night. Official chip counts and seating assignments will be posted within the hour, and the players will resume at 1pm EST to play down to a winner. Tune in tomorrow to watch the live stream! With the elimination of our 19th place finisher, the final 2 tables have been reached in Event #1 $365 NLH. The clock has been paused with 2 minutes and 3 seconds left in the 4,000/8,000 blind level. The field will play one more level and then bag up their chips for the night.